A starting point for two very pleasant walks-Dalilea to the Green Isle walk, and the Dalilea to Kinlochmoidart walk. 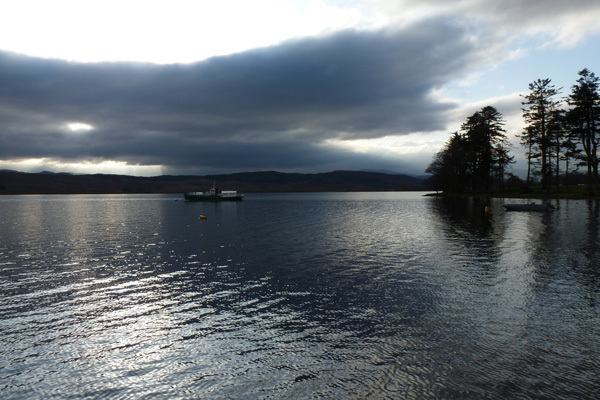 The Green Isle Walk is a short pleasant walk along a track along the shores of Loch Shiel through rough grassland and pockets of pine and Atlantic oak woodland. The route follows the old coffin route from Dalilea to a jetty opposite the Green Isle. Look out for Dalilea House on your way to the start of the walk. The poet Alistair Mac Mahaigstir was born in Dalilea on the site of the present Dalilea House. The former house was also visited by Bonnie Prince Charles just before he raised his standard at Glenfinnan in 1745. The current house was built in the early 19th century with additions in the early 20th century. 1. Park at Dalilea pier and head through the metal gate to join the track, continue until you reach a second metal gate just before the house. The track passes by a 19th century sheep fank and a World War I memorial erected by the estate opener, Lord Howard Glossop, in memory of his son who died in the war. 2. Head through this gate into the field and follow the track skirting around the loch to the old pier along the shore of Loch Shiel. The track is a little indistinct in places and can be boggy in places. The mound of rounded stones with a depression in the centre on the left, just beyond the ford, is thought to be a bronze age burial cairn (see Moidart History Walk 6). Other evidence. in the form of a larger mould by the old stone pier, is suggestive of medieval occupation of the area. The walk affords good views over the loch to the Green Isle and Beinn Respiole. The Green Isles, also known as St Finan’s Isle, has served as an ancestral burial site for the MacDonald’s of Clanranald and the local Catholic priests. The island was accessed by the pier at Port an Eilein. 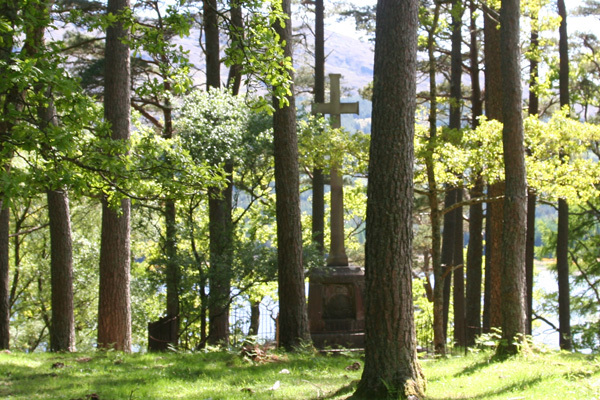 The large cross in the foreground marks the burial place of Reverend Charles MacDonald, author of 'Moidart or among the Clanranalds'. The remains of the stone church is also evident. There are many funeral cairns in the area that mark the coffin routes taken to the island. The route is marked in green on the map. 3. Return back by the same route. 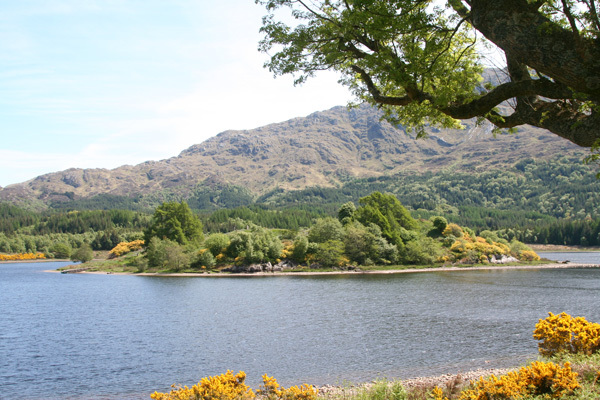 See Moidart History Walk 6 (A walk along the north shore of Loch Shiel) for more information of the history of the area and an extension of the walk to the deserted settlement of Druim an Laoigh. 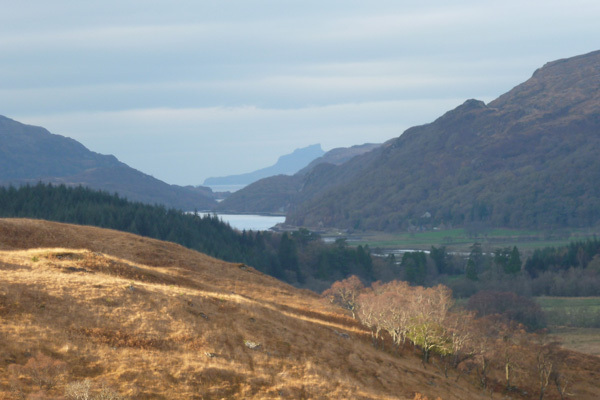 This is a pleasant walk along a well defined track over the hills to Kinlochmoidart, affording fine views to Loch Moidart and the Isle of Eigg. 1. Take the public footpath to Kinlochmoidart from Dalilea, which is signposted opposite Dalilea House. Take the right hand fork after crossing the bridge, about 3km into the walk. Follow the track to the road running through Glen Moidart. Turn left onto the road and head towards Kinlochmoidart by the banks of the River Moidart. The river is fringed with some fine old oaks strewn with lichens and mosses and the occasional epiphytic polypody fern. Look out for dippers in the River Moidart. 2. Just before you reach the bridge over the River Moidart, take the track on the left. This track takes you back to junction from whence you can retrace your steps over the hills back to Dalilea. The route is marked in red. The route can be very muddy in sections but well worth the effort. If you would like to extend the walk you can turn right when you reach the Glenmoidart road (rather than left) and do the Glenmoidart Walk. Alternatively, you can continue over the bridge and continue to walk by the banks of the river (River Moidart Walk) or join the Prince's Walk at Kinlochmoidart. 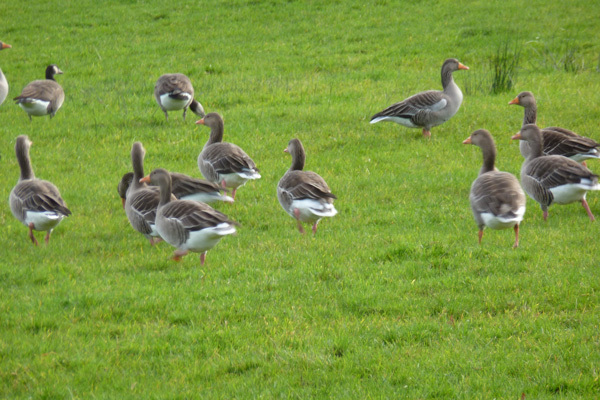 Please refer to details in local walking guides.